Such participatory, relational and investigative literary and art works as Kate Schapira’s Town, C. D. Wright and Deborah Luster’s One Big Self, the work of Krzystof Wodiczko, Rirkrit Tiravanija, and Bhanu Kapil got me thinking about including other voices in my own literary "voice." Taking my cue from Kapil’s The Vertical Interrogation of Strangers, from which I took the idea of a questionnaire, I wrote a set of questions. 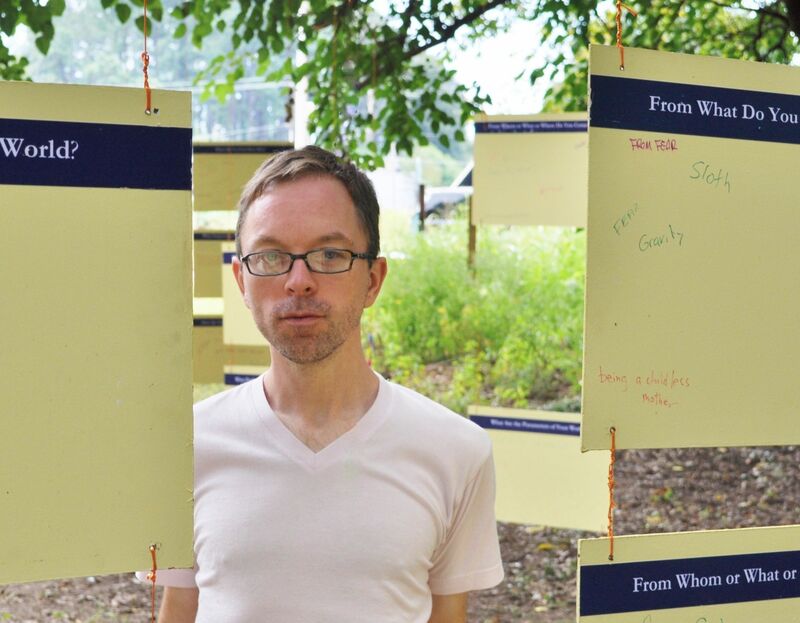 I emailed these questions to friends, colleagues and acquaintances; I placed a binder of them in a gallery in Athens, GA for people to fill out; I started this website to cull further responses; I posted them along a stretch of the Atlanta BeltLine green space as a participatory text art installation; I waited and wait for answers. I hope you’ll offer me your own on the (questions) page of this site. To all those who have and will entrust me with their responses, thank you for your generosity. My plan is to use your answers in part or whole, as they come or as I adapt, collage, and transform them, and my writing in response to the questions and others' answers. My plan, as always, is to see what happens as the writing unfolds. Michael Tod Edgerton is the author of Vitreous Hide (Lavender Ink). His writing has appeared in such journals as Boston Review, Coconut, Denver Quarterly, Drunken Boat, EOAGH, New American Writing, and Word For/Word. Tod holds an MFA from Brown University and a PhD from the University of Georgia. He currently lives in San Francisco and flits about Twitter as @TodEdge. His more generally generic author website is MichaelTodEdgerton.blogspot.com. If you're interested in having this project installed and/or performed in your space, reviewing print and/or sound work for publication, or have any message or feedback about the project, please contact Michael Tod Edgerton either by using the form below or sending an email directly to tod [at] whatmostvividly [dot] com. If you would like to contribute any of your own answers to the project, please use the form on the (questions) page. Thank you!